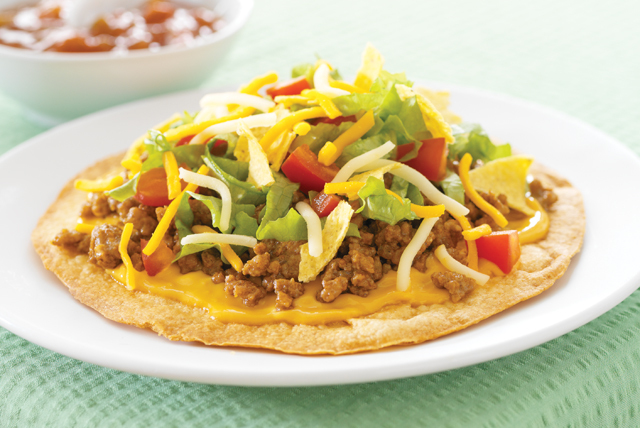 Lettuce makes these tostadas taco salad's cousin, but it's the nacho cheese sauce and shredded Cheddar that make them doubly cheesy. Spray both sides of Tortillas with cooking spray, then place in a single layer on baking sheet. Bake 10 min. or until crisp and lightly browned. Cook meat with Taco Seasoning Mix as directed on package. Spread each tortilla with 1 Tbsp. Nacho Cheese Sauce; top with meat mixture and lettuce. Crumble 1 Taco Shell over each tostada; top with tomato, cheese and salsa. Serve with a side of hot cooked rice and black beans. Brush both sides of tortillas with oil instead of spraying with cooking spray.